Twelve cities, twelve stories – a compilation that will give you an idea of what Indian cities are made up of. An absolutely delightful way to learn Indian History. 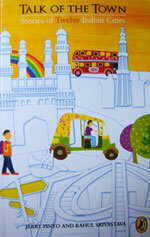 Jerry Pinto and Rahul Srivastava have come up with a brilliant book that takes you on a tour of 12 cities in India. The history of the city is appealing and snappy bringing alive the magic of the city. So, keep aside your history book and read Talk of the Town to understand how it all happened. Then, go back to your history text and you will find everything makes perfect sense! Beginning with “Bangalore: The city is with IT”, the tour takes you through Bhopal, Chandigarh, Chennai, Delhi, Hyderabad, Kolkata, Lucknow, Mumbai, Patna, Shillong and Thiruvananthapuram. There are some facts that many don’t know about. For example, everyone knows that Le Corbusier ‘designed’ Chandigarh. Did you know that a young engineer named P.L. Verma chose the appropriate site for the city and Albert Mayer, was appointed to create the city and his partner Albert Nowicki sketched the conceptual schemes? But then tragedy struck and Nowicki died in a plane crash and a devastated Mayer withdrew from the project. It was then that le Corbusier was invited to carry these plans through. Did you know that in the 17th century, Bhopal was ruled by a Gond queen – Kamalavati and “she represented the rich cultural traditions of the Gonds. These allowed for an equal relationship between women and men and a less rigid practice of the caste system.” Four generations of women – the famous Begums of Bhopal, ruled the city-state of Bhopal for more that 100 years. That Bombay was given as a dowry to Charles II for his marriage to Portuguese princess Catherine de Braganza is common knowledge. But the fact that Charles thought the islands were somewhere in Brazil may come as a shock to many! At the end of every studied write up about a city there is a small personal anecdote giving the reader a glimpse of the heart of the city. All in all, an interesting book, packed tight with facts.